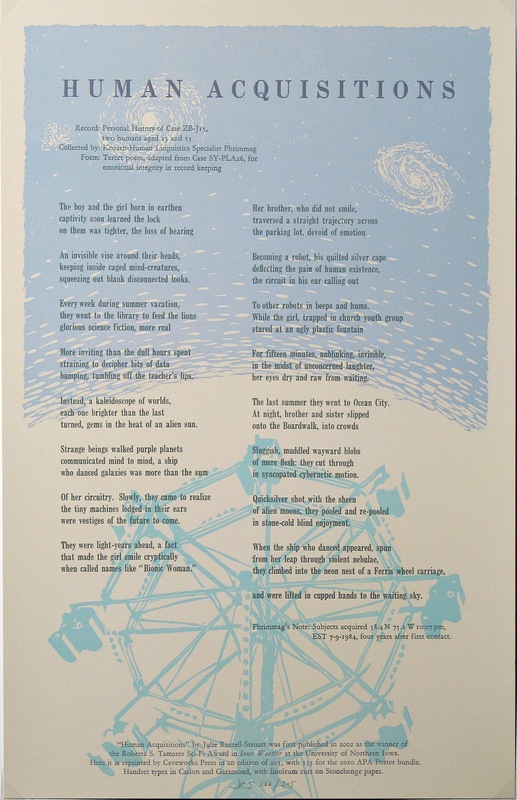 Letterpress printed broadside of poem “Human Acquisitions” by Julie Russell-Steuart. Originally printed for the 2010 APA poster bundle, with 55 prints reserved for sale. Handset type in gray and linoleum cuts in two colors on gray Stonehenge paper. The subject matter is a sci-fi inspired, somewhat fantastic account of growing up with hearing loss (based on my experience). It is the story of a boy and a girl, brother and sister, who find the world of reading, particularly sci-fi, much more attractive than the real world, who escape into fantasy as a means of coping with the social alienation of hearing loss. A bit of a surprise ending, too. 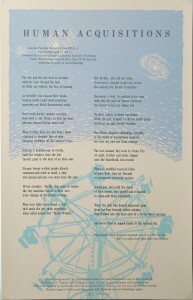 It was featured in a Atelier 6000 Broadside Exhibition at Atelier 6000 in November of 2010.